With no sufficient vegetables at hand, a Sunday meal can still be a special one if you have soya chunks at hand. I prepared this soya chunks biryani with a slight variation from my usual vegetable biryani. Those who doesn't like soya chunks can replace it with vegetables. Did you know? Soya chunks (alternatively called as meal maker in India) is a good source of protein especially considered as a best replacement for meat based proteins. 1) Clean and soak soya chunks in warm water for 15 minutes or follow the package instructions for cleaning and soaking. 2) In a pan, heat oil. When it is hot, add fennel seeds, bay leaves, cinnamon stick and green cardamon. 3) When they crackle, add onions and fry till they become soft. 4) Add ginger garlic paste and saute for a minute. 5) Add tomatoes and continue sauteing till they mashes well. 6) Add mixed vegetables and give a quick stir. 7) Lower the flame and sprinkle handful of water. Cover and cook for 10 minutes. Make sure the bottom of the pan is not getting burn. 8) When the vegetables are half cooked, add soya chunks and transfer the entire content to pressure cooker. 9) Add red chilli powder, coriander powder, turmeric powder, salt, mint and coriander leaves. Mix well. 10) Add 1 cup coconut milk and 1 and 3/4 cups of water. 11) When it starts to boiling, add rice and gently mix it using spatula and cover the pressure cooker using the lid. 12) Wait for 3 whistle or according to your pressure cooker type and rice type. 13) Open when the steam completely releases from pressure cooker. 14) Allow it to cool for few minutes and very gently mix the rice. 15) Serve hot with raita. 1) The entire process can also be done only in pressure cooker. As I am not convenient with it, First I cooked vegetables in pan, then transferred it to pressure cooker. 2) You can add any vegetables of your choice. Sending this recipe to Reva's Cooking with seeds - Rice event. Looks delicious... my favorite and perfectly done. yummy !! love the biriyani with soya chunks!! I Liked this when my friend made it - but when I actually bought the soya chunks and followed her recipe - soaking them in water, they looked too much like meat for me to enjoy it anymore - What I do now is use it much like we use vadams (karuvadams) fry them up in a shallow pan and add them - not the healthiest but gets the protein! Delicious biryani with meal maker...mostly u add coconut milk in all your biryani it seems..,def it gives rich taste n flavor...will try next time !!! Mealmaker Biryani will taste surely good.Yumm click as well. Soya Chunks Biryani looks very inviting and yummy with great flavours !! wow.. looks absolutely delicious... thanks for sharing..
Awesome,superb.First time here,happy to know a fellow blogger from my state,happy to following u dear.U r having such a wonderful blog,that drags me on ur way. Will surely try ths soon!!! I used to make a version of this often,but lately this had been out of my mind.Your version looks super. This looks lovely . I still have a pack of soya chunks which is not used as I didn't have a recipe at hand.. Your version looks lovely.. Thanks for sending it to the event..
Ur step pics always amaze me..wonderful..biryani looks mouthwatering..
super looking and delicious.. healthy too with protien loaded soya chunks.. They look so nice and yummy...I love soya chunks ..simply delicious! 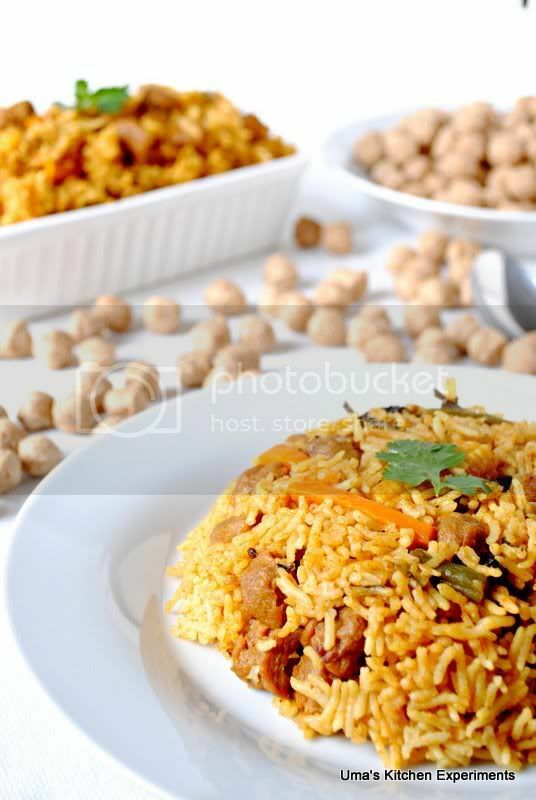 I can happily have this briyani anytime with onion raita, lovely dish..
Nice way to cook soya chunk,delicious briyani! looks inviting...love to have with raita,my daughter fav biryani!! Lovely color and can smell the biryani from your clicks. Comforting and delicious soya chunks biryani. I liked the pics with step by step process. My rice is in the cooker while I am sending you this comment...:) hope it turns out good. I forgot to add wat to the coconut milk. I added while the rice is cooking though. Found In Folsom, Thanks for trying it out. Hope it turned out good. If you maintain 2 cups of water for a cup, then also the rice taste good without the coconut milk. Hope you did so.